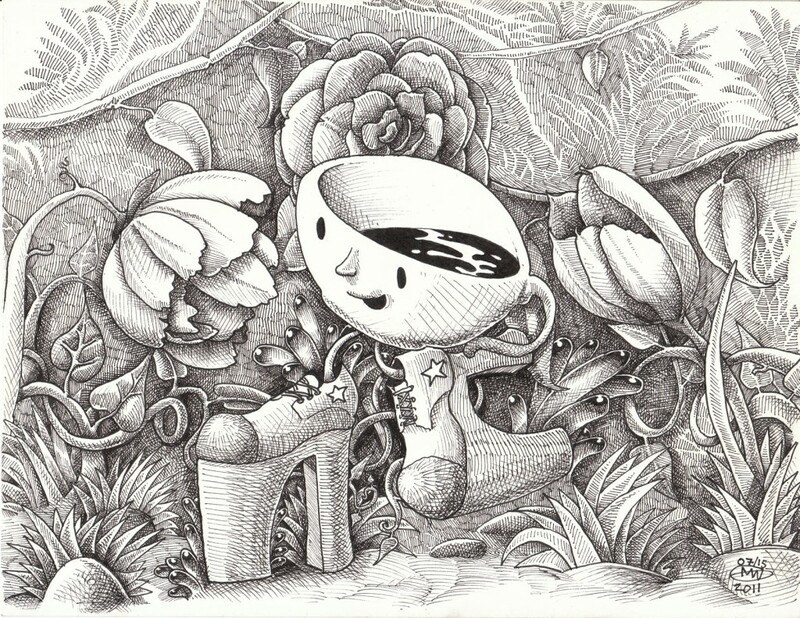 Title: Stepping Out Medium: Pen and ink on Bristol Date: 07/15/2011 Dimensions: 8.5” X 11” Description: Every once in a while I go through my old sketchbooks, especially when I'm procrastinating, and find a character that I really enjoy. Cupie as he is affectionately known came into being in the early 1990's and has been showing up in drawings ever since. I was doing some real PRO-crastination the other day when I found a little comic telling the origins of Cupies magic disco shoes. He was granted them by Coyote so that he'd be able to retrieve the wig of Sonny Bono (he was still alive then). Feeling tickled I decided to do a tribute to this little guy and drew this.